This entry was posted in Family History, Kunkel Family History and tagged Denis Kunkel, Gavin, Pechey, Sepia Saturday by cassmob. Bookmark the permalink. Such an intriguing mystery Pauleen! Do you have any idea why the photograph was behind the other picture? Would it be possible to have it restored, so that you might clearly see the background? Front and centre, I wonder who is the man reclining on what looks like an animal skin? I hope you are able to learn more about the image and the event. No Jennifer, no idea why it was hidden -I guess I was lucky it didn’t just get thrown out. I suspect it might be beyond restoration…back nearly 20 years ago when I tried to have it scanned as a whole image, they snapped it in two. Luckily I already had this copy. May be worth thinking about the restoration possibilities. Like you I wonder why he was odd man out languishing on the rug. Sorry about the delayed reply -somehow you’d disappeared into the spam basket. A fascinating elusive photograph. 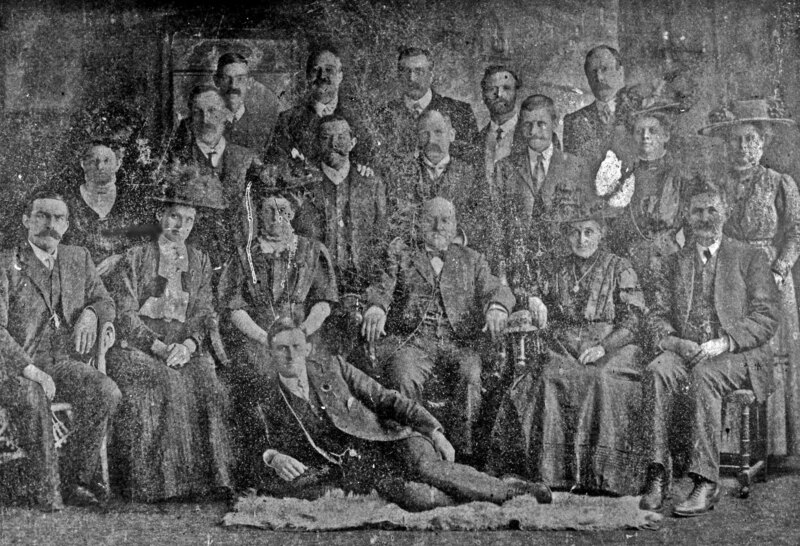 Could the woman to the right of the central seated gentleman be his wife – she does look older than the rest of the group. otherwise most seem of a similar age, apart from the young man on the rug. I had an unidentified family group photo of five people which I suspected was a sister of my great grandmother (she was one of 5 surviving sisters). But because of the composition of the family, and likely ages of the children, I could eliminate certain sisters. I was lucky because an internet contact who proved to be my third cousin had the same photo and I had guessed the right sister. With such a large group you have a much trickier challenge. Good luck! . ,. Thanks Susan, I agree it’s a challenge. The problem is that I have photos of many of my grandfather’s family and while some look similar the ages don’t fit. I did wonder the same thing about the older woman too, and initially I thought it might have been my grandfather’s maternal relatives. Unfortunately his grandfather would have been dead by this time. It’s very frustrating. I keep living in hope that someone will say “oh there’s my xxxx” and the mystery might unravel. “Spat the dummy” — had to Google that expression. I hope you find an answer to your mystery. Thank Wendy. Thought I’d put that colloquialism in just to intrigue people. Good luck with the surprise IDs! I guess the young man lying on the rug down front is the baby of the group. Thanks Kristin. Yes he does look the youngest and hence I thought the lowest in the pecking order until I saw some other group photos (all men) where those lying were not youngsters. Tis a mystery. Good luck with your mystery. It looks like a large enough group that perhaps a descendant of one of the others in the group has the same photo and will connect with you someday. I hope so. I do keep hoping Jackie, hence the casting of the net every so often. It seems improbable that no one else has this photo. Just one more name might open up the solution. Lots of nice-looking moustaches & a couple of beards here. The fellow reposing in front is a rather handsome dude! But I have a question: The beautiful green picture at the head of your blog – where was that taken? It’s gorgeous! Yes they were resplendent in their hairiness. If the green picture was a patchwork quilt of fields, then it was Co Clare. The other two which have lots of green are of Dorfprozelten in Bavaria. The images rotate when people log in. Wow, with the family resemblances, I can see how it would be hard to unravel the mystery. Hope someone out there has some definitive info. This summer, I was lucky to have that very thing happen. A relative I had never met, or even knew about, was at the reunion and she said, in an off hand manner, “Oh, I have the original of that photo.” and Voila! everything fell into place. Good luck on your search. Thanks Joan, you’ve given me hope with your great success story. Keep trying seems to be the go.